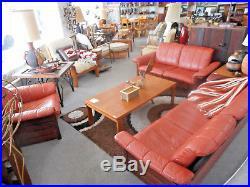 Item Description: Danish Modern wood frame sofa, loveseat and matching lounge chair presumed to be by Ekornes, Norway with rust or burnt orange leather cushions and solid wood frames stained a walnut or rosewood tone. Price is for three pieces. Nice sturdy wood frames. Materials: wood and leather with metal supports and fabric. It is not marked and only loosely identified by design. 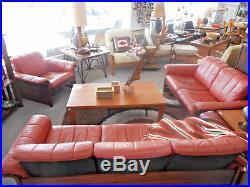 Dimensions: Sofa: 78″w x 31″d x 28″h Seat ht 14″, Chair: 36″w x 31″d x 28″h Seat ht 14″ Loveseat: 58″w x 31″D X 28″ H Seat ht 14″. Condition: Good vintage condition with light leather wear from age. One arm cushion is more deeply toned than the others, but otherwise clean and soft all around (see photo). All seat and back cushions are sized the same can be set in the frames as desired. Some light cat “pokes” on a couple of arms. Additional details: This is a nice presentable matched sofa, loveseat and chair set which has solid wood frames and loose cushions. Comfortable and refined for a smaller seating group. Frames and construction are consistent with early Ekornes products. Shop our store with confidence. Retrospect Design is a full service mid century and Danish modern furniture and art resource located in Santa Cruz, California. Vintage items may contain wear and signs of use commensurate with their age. We try to photograph and describe conditions faithfully, but always welcome questions where more specific information may be needed. We use PlyconVanLines, Uship, private carriers or the shipper of your choice. Local pick-up is available at our store. The address is 806 Pacific Avenue, Santa Cruz, CA 95060. Feel free to drop by our store and shop with us in person. We’d love to see you! Santa Cruz, CA 95060. The item “Danish Modern Stressless Ekornes Style Sofa, Loveseat & Lounge Chair Leather” is in sale since Saturday, February 03, 2018. This item is in the category “Antiques\Furniture\Sofas & Chaises\Post-1950″. The seller is “retrospectmcm” and is located in Santa Cruz, California. This item can be shipped to United States.